From the earliest times most cultures produced a stream of nurses dedicated to service on religious principles. Both Christendom and the Muslim World generated a stream of dedicated nurses from their earliest days. In Europe before the foundation of modern nursing, Catholic nuns and the military often provided nursing-like services. It took until the 19th century for nursing to become a secular profession. The early history of nurses suffers from a lack of source material, but nursing in general has long been an extension of the wet-nurse function of women. Buddhist Indian ruler (268 B.C.E. to 232 B.C.E.) Ashoka erected a series of pillars, which included an edict ordering hospitals to be built along the routes of travelers, and that they be "well provided with instruments and medicine, consisting of mineral and vegetable drugs, with roots and fruits"; "Whenever there is no provision of drugs, medical roots, and herbs, they are to be supplied, and skilful physicians appointed at the expense of the state to administer them." The system of public hospitals continued until the fall of Buddhism in India ca. 750 C.E. About 100 B.C.E. the Charaka Samhita was written in India, stating that good medical practice requires a patient, physician, nurse, and medicines, with the nurse required to be knowledgeable, skilled at preparing formulations and dosage, sympathetic towards everyone, and clean. The first known Christian nurse, Phoebe, is mentioned in Romans 16:1. During the early years of the Christian Church (ca. 50 C.E. ), St. Paul sent a deaconess named Phoebe to Rome as the first visiting nurse. From its earliest days, following the edicts of Jesus, Christianity encouraged its devotees to tend the sick. Priests were often also physicians. According to the historian Geoffrey Blainey, while pagan religions seldom offered help to the infirm, the early Christians were willing to nurse the sick and take food to them, notably during the smallpox epidemic of AD 165-180 and the measles outbreak of around AD 250; "In nursing the sick and dying, regardless of religion, the Christians won friends and sympathisers". Following the First Council of Nicaea in 325 AD, Christianity became the official religion of the Roman Empire, leading to an expansion of the provision of care. Among the earliest were those built ca. 370 by St. Basil the Great, bishop of Caesarea Mazaca in Cappadocia in Asia Minor (modern-day Turkey), by Saint Fabiola in Rome ca. 390, and by the physician-priest Saint Sampson (d. 530) in Constantinople, Called the Basiliad, St. Basil's hospital resembled a city, and included housing for doctors and nurses and separate buildings for various classes of patients. There was a separate section for lepers. Eventually construction of a hospital in every cathedral town was begun. Christian emphasis on practical charity gave rise to the development of systematic nursing and hospitals after the end of the persecution of the early church. Ancient church leaders like St. Benedict of Nursia (480-547) emphasized medicine as an aid to the provision of hospitality. 12th century Roman Catholic orders like the Dominicans and Carmelites have long lived in religious communities that work for the care of the sick. Some hospitals maintained libraries and training programs, and doctors compiled their medical and pharmacological studies in manuscripts. Thus in-patient medical care in the sense of what we today consider a hospital, was an invention driven by Christian mercy and Byzantine innovation. Byzantine hospital staff included the Chief Physician (archiatroi), professional nurses (hypourgoi) and orderlies (hyperetai). By the twelfth century, Constantinople had two well-organized hospitals, staffed by doctors who were both male and female. Facilities included systematic treatment procedures and specialized wards for various diseases. In the early 7th century, Rufaidah bint Sa’ad (also known as Rufaida Al-Aslamia) became what is now described as the first Muslim nurse. A contemporary of Muhammad, she hailed from the Bani Aslam tribe in Medina and learned her medical skills from her father, a traditional healer. After she had led a group of women to treat injured fighters on the battlefield, Muhammad gave her permission to set up a tent near the Medina mosque to provide treatment and care for the ill and the needy. During the late 700s and early 800s, Emperor Charlemagne decreed that those hospitals which had been well conducted before his time and had fallen into decay should be restored in accordance with the needs of the time. He further ordered that a hospital should be attached to each cathedral and monastery. During the tenth century the monasteries became a dominant factor in hospital work. The famous Benedictine Abbey of Cluny, founded in 910, set the example which was widely imitated throughout France and Germany. Besides its infirmary for the religious, each monastery had a hospital in which externs were cared for. These were in charge of the eleemosynarius, whose duties, carefully prescribed by the rule, included every sort of service that the visitor or patient could require. As the eleemosynarius was obliged to seek out the sick and needy in the neighborhood, each monastery became a center for the relief of suffering. Among the monasteries notable in this respect were those of the Benedictines at Corbie in Picardy, Hirschau, Braunweiler, Deutz, Ilsenburg, Liesborn, Pram, and Fulda; those of the Cistercians at Arnsberg, Baumgarten, Eberbach, Himmenrode, Herrnalb, Volkenrode, and Walkenried. No less efficient was the work done by the diocesan clergy in accordance with the disciplinary enactments of the councils of Aachen (817, 836), which prescribed that a hospital should be maintained in connection with each collegiate church. The canons were obliged to contribute towards the support of the hospital, and one of their number had charge of the inmates. As these hospitals were located in cities, more numerous demands were made upon them than upon those attached to the monasteries. In this movement the bishop naturally took the lead, hence the hospitals founded by Heribert (died 1021) in Cologne, Godard (died 1038) in Hildesheim, Conrad (died 975) in Constance, and Ulrich (died 973) in Augsburg. But similar provision was made by the other churches; thus at Trier the hospitals of St. Maximin, St. Matthew, St. Simeon, and St. James took their names from the churches to which they were attached. During the period 1207–1577 no less than 155 hospitals were founded in Germany. The Ospedale Maggiore, traditionally named Ca' Granda (i.e. Big House), in Milan, northern Italy, was constructed to house one of the first community hospitals, the largest such undertaking of the fifteenth century. Commissioned by Francesco Sforza in 1456 and designed by Antonio Filarete it is among the first examples of Renaissance architecture in Lombardy. According to Geoffrey Blainey, the Catholic Church in Europe provided many of the services of a welfare state: "It conducted hospitals for the old and orphanages for the young; hospices for the sick of all ages; places for the lepers; and hostels or inns where pilgrims could buy a cheap bed and meal". It supplied food to the population during famine and distributed food to the poor. This welfare system the church funded through collecting taxes on a large scale and possessing large farmlands and estates. The Eastern Orthodox Church had established many hospitals in the middle east, but following the rise of Islam from the 7th century, Arabic medicine developed in this region, where a number of important advances were made and an Islamic tradition of nursing begun. Arab ideas were later influential in Europe. The famous Knights Hospitaller arose as a group of individuals associated with an Amalfitan hospital in Jerusalem, which was built to provide care for poor, sick or injured Christian pilgrims to the Holy Land. Following the capture of the city by Crusaders, the order became a military as well as infirmarian order. Roman Catholic orders such as the Franciscans stressed tending the sick, especially during the devastating plagues. The Catholic elites provided hospital services because of their theology of salvation that good works were the route to heaven. The same theology holds strong into the 21st century. In Catholic areas, the tradition of nursing sisters continued uninterrupted. Several orders of nuns provided nursing services in hospitals. A leadership role was taken by the Daughters of Charity of Saint Vincent de Paul, founded in France in 1633. New orders of Catholic nuns expanded the range of activities and reached new areas. For example, in rural Brittany in France, the Daughters of the Holy Spirit, created in 1706, played a central role. New opportunity for nuns as charitable practitioners were created by devout nobles on their own estates. The nuns provided comprehensive care for the sick poor on their patrons' estates, acting not only as nurses, but took on expanded roles as physicians, surgeons, and apothecaries. The French Catholics in New France (Canada) and New Orleans continued these traditions. During the French Revolution, most of the orders of nurses were shut down and there was no organized nursing care to replace them. However the demand for their nursing services remained strong, and after 1800 the sisters reappeared and resumed their work in hospitals and on rural estates. They were tolerated by officials because they had widespread support and were the link between elite physicians and distrustful peasants who needed help. The Protestant reformers, led by Martin Luther, rejected the notion that rich men could gain God's grace through good works—and thereby escape purgatory—by providing cash endowments to charitable institutions. They also rejected the Catholic idea that the poor patients earned grace and salvation through their suffering. Protestants generally closed all the convents and most of the hospitals, sending women home to become housewives, often against their will. On the other hand, local officials recognized the public value of hospitals, and some were continued in Protestant lands, but without monks or nuns and in the control of local governments. In the 16th century, Protestant reformers shut down the monasteries and convents, though they allowed a few to continue in operation. Those nuns who had been serving as nurses were given pensions or told to get married and stay home. Between 1600 and 1800, Protestant Europe had a few noticeable hospitals, but no regular system of nursing. The weakened public role of women left female practitioners restricted to assisting neighbors and family in an unpaid and unrecognized capacity. Modern nursing began in the 19th century in Germany and Britain, and spread worldwide by 1900. Phoebe, the nurse mentioned in the New Testament, was a deaconess. The role had virtually died out centuries before, but was revived in Germany in 1836 when Theodor Fliedner and his wife Friederike Münster opened the first deaconess motherhouse in Kaiserswerth on the Rhine. The diaconate was soon brought to England and Scandinavia, Kaiserswerth model. The women obligated themselves for 5 years of service, receiving room, board, uniforms, pocket money, and lifelong care. The uniform was the usual dress of the married woman. There were variations, such as an emphasis on preparing women for marriage through training in nursing, child care, social work and housework. In the Anglican Church, the diaconate was an auxiliary to the pastorate, and there were no mother houses. By 1890 there were over 5,000 deaconesses in Protestant Europe, chiefly Germany Scandinavia and England. In World War II, diaconates in war zones sustained heavy damage. As eastern Europe fell to communism, most diaconates were shut down, and 7000 deaconesses became refugees in West Germany. By 1957, in Germany there were 46,000 deaconesses and 10,000 associates. Other countries reported a total of 14,000 deaconesses, most of them Lutherans. In the United States and Canada 1550 women were counted, half of them in the Methodist Church. William Passavant in 1849 brought the first four deaconesses to Pittsburgh, after visiting Kaiserswerth. They worked at the Pittsburgh Infirmary (now Passavant Hospital). Between 1880 and 1915, 62 training schools were opened in the United States. The lack of training had weakened Passavant's programs. However recruiting became increasingly difficult after 1910 as women preferred graduate nursing schools or the social work curriculum offered by state universities. The Crimean War was a significant development in nursing history when English nurse Florence Nightingale laid the foundations of professional nursing with the principles summarised in the book Notes on Nursing. A fund was set up in 1855 by members of the public to raise money for Florence Nightingale and her nurses' work In 1856, £44,039 (equivalent to roughly over £2 million today) was pooled and with this Nightingale decided to use the money to lay the foundations for a training school at St Thomas' Hospital. In 1860, the training for the first batch of nurses began; upon graduation from the school, these nurses used to be called 'Nightingales'. Nightingale's contemporary, Mary Seacole, was a Jamaican "doctress" who also nursed soldiers who were wounded during the Crimean War, and in the tradition of Jamaican doctresses, Seacole practised the hygiene that was later adopted by Nightingale in her writings after the Crimean War. Nightingale's revelation of the abysmal nursing care afforded soldiers in the Crimean War energized reformers. Queen Victoria in 1860 ordered a hospital to be built to train Army nurses and surgeons, the Royal Victoria Hospital. The hospital opened in 1863 in Netley and admitted and cared for military patients. Beginning in 1866, nurses were formally appointed to Military General Hospitals. The Army Nursing Service (ANS) oversaw the work of the nurses starting in 1881. These military nurses were sent overseas beginning with the First Boer War (often called Zulu War) from 1879 to 1881. They were also dispatched to serve during the Egyptian Campaign in 1882 and the Sudan War of 1883 to 1884. During the Sudan War members of the Army Nursing Service nursed in hospital ships on the Nile as well as the Citadel in Cairo. Almost 2000 nurses served during the second Boer War, the Anglo-Boer War of 1899 to 1902, alongside nurses who were part of the colonial armies of Australia, Canada and New Zealand. They served in tented field hospitals. 23 Army Nursing sisters from Britain lost their lives from disease outbreaks. New Zealand was the first country to regulate nurses nationally, with adoption of the Nurses Registration Act on the 12 September 1901. It was here in New Zealand that Ellen Dougherty became the first registered nurse. Canadian nursing dates all the way back to 1639 in Quebec with the Augustine nuns. These nuns were trying to open up a mission that cared for the spiritual and physical needs of patients. The establishment of this mission created the first nursing apprenticeship training in North America. In the nineteenth century there were some Catholic orders of nursing that were trying to spread their message across Canada. These women had only an occasional consultations with a physician. Towards the end of the nineteenth century hospital care and medical services had been improved and expanded. Much of this was due to the Nightingale model, which prevailed in English Canada. In 1874 the first formal nursing training program was started at the General and Marine Hospital in St. Catharines in Ontario. Many programs popped up in hospitals across Canada after this one was established. Graduates and teachers from these programs began to fight for licensing legislation, nursing journals, university training for nurses, and for professional organizations for nurses. The first instance of Canadian nurses and the military was in 1885 with the Northwest Rebellion. Some nurses came out to aid the wounded. In 1901 Canadian nurses were officially part of the Royal Canadian Army Medical Corps. Georgina Fane Pope and Margaret C. MacDonald were the first nurses officially recognized as military nurses. Canadian missionary nurses were also of great importance in Henan, China as a part of the North China Mission starting in 1888. In the late nineteenth and early twentieth centuries women made inroads into various professions including teaching, journalism, social work, and public health. These advances included the establishment of a Women's Medical College in Toronto (and in Kingston, Ontario) in 1883, attributed in part to the persistence of Emily Stowe, the first female doctor to practice in Canada. Stowe's daughter, Augusta Stowe-Gullen, became the first woman to graduate from a Canadian medical school. After World War II, the health care system expanded and was nationalized with medicare. Currently there are 260,000 nurses in Canada but they face the same difficulties as most countries, as technology advances and the aging population requires more nursing care. During most of Mexico's wars in the nineteenth and early twentieth centuries, camp followers known as soldaderas nursed soldiers wounded in warfare. During the Mexican Revolution (1910-1920) care of soldiers in northern Mexico was also undertaken by the Neutral White Cross, founded by Elena Arizmendi Mejia after the Mexican Red Cross refused to treat revolutionary soldiers. The Neutral White Cross treated soldiers regardless of their faction. Professionalization of nursing in France came in the late 19th and early 20th century. In 1870 France's 1,500 hospitals were operated by 11,000 Catholic sisters; by 1911 there were 15,000 nuns representing over 200 religious orders. Government policy after 1900 was to secularize public institutions, and diminish the role the Catholic Church. The lay staff was enlarged from 14,000 in 1890 to 95,000 in 1911. This political goal came in conflict with the need to maintain better quality of medical care in antiquated facilities. Many doctors, while personally anti-clerical, realized their dependence on the Catholic sisters. Most lay nurses came from peasant or working-class families and were poorly trained. Faced with the long hours and low pay, many soon married and left the field, while the Catholic sisters had renounced marriage and saw nursing as their God-given vocation. New government-operated nursing schools turned out nonreligous nurses who were slated for supervisory roles. During the World War, an outpouring of patriotic volunteers brought large numbers of untrained middle-class women into the military hospitals. They left when the war ended but the long-term effect was to heighten the prestige of nursing. In 1922 the government issued a national diploma for nursing. Portrait of Lillian Wald, pioneer of public health nursing, by William Valentine Schevill, National Portrait Gallery in Washington, D.C. In the early 1900s, the autonomous, nursing-controlled, Nightingale-era schools came to an end. Despite the establishment of university-affiliated nursing schools, such as Columbia and Yale, hospital training programs were dominant. Formal "book learning" was discouraged in favor of clinical experience through an apprenticeship. In order to meet a growing demand, hospitals used student nurses as cheap labor at the expense of quality formal education. Mary Seacole came from a long line of Jamaican nurses, or "doctresses", who worked at healing British soldiers and sailors at the Jamaican military base of Port Royal. These doctresses of the eighteenth century used good hygiene and herbal remedies to nurse their clients back to health. In the eighteenth century, these doctresses included Seacole's mother, who was a mixed-race woman who was most likely a child of a slave, and who acquired medical knowledge of herbal remedies from West African ancestors. Another eighteenth century doctress was Cubah Cornwallis, who nursed back to health famous sailors such as the young Horatio Nelson, 1st Viscount Nelson and Sailor Bill, who later became William IV of the United Kingdom. The number of hospitals grew from 149 in 1873 to 4,400 in 1910 (with 420,000 beds) to 6,300 in 1933, primarily because the public trusted hospitals more and could afford more intensive and professional care. They were operated by city, state and federal agencies, by churches, by stand-alone non-profits, and by for-profit enterprises run by a local doctor. All the major denominations built hospitals; in 1915, the Catholic Church ran 541, staffed primarily by unpaid nuns. The others sometimes had a small cadre of deaconesses as staff. Most larger hospitals operated a school of nursing, which provided training to young women, who in turn did much of the staffing on an unpaid basis. The number of active graduate nurses rose rapidly from 51,000 in 1910 to 375,000 in 1940 and 700,000 in 1970. The modern deaconess movement began in Germany in 1836 when Theodor Fliedner and his wife opened the first deaconess motherhouse in Kaiserswerth on the Rhine. It became a model and within a half century were over 5,000 deaconesses in Europe. The Chursh of England named its first deaconess in 1862. The North London Deaconess Institution trained deaconesses for other dioceses and some served overseas. In 1884, U.S. Lutherans, particularly John D. Lankenau, brought seven sisters from Germany to run the German Hospital in Philadelphia. By 1963, the Lutheran Church in America had centers for deaconess work in Philadelphia, Baltimore, and Omaha. In the U.S., the role of public health nurse began in Los Angeles in 1898, by 1924 there were 12,000 public health nurses, half of them in the 100 largest cities. Their average annual salary in larger cities was $1,390. In addition, there were thousands of nurses employed by private agencies handling similar work. Public health nurses supervised health issues in the public and parochial schools, to prenatal and infant care, handled communicable diseases and tuberculosis and dealt with an aerial diseases. During the Spanish–American War of 1898, medical conditions in the tropical war zone were dangerous, with yellow fever and malaria endemic. The United States government called for women to volunteer as nurses. Thousands did so, but few were professionally trained. Among the latter were 250 Catholic nurses, most of them from the Daughters of Charity of St. Vincent de Paul. Sporadic progress was made on several continents, where medical pioneers established formal nursing schools. But even as late as the 1870s, "women working in North American urban hospitals typically were untrained, working class, and accorded lowly status by both the medical profession they supported and society at large". Nursing had the same status in Great Britain and continental Europe before World War I. In late the 1920s, the women's specialties in health care included 294,000 trained nurses, 150,000 untrained nurses, 47,000 midwives, and 550,000 other hospital workers (most of them women). In recent decades, professionalization has moved nursing degrees out of RN-oriented hospital schools and into community colleges and universities. Specialization has brought numerous journals to broaden the knowledge base of the profession. Grace McDougall (1887–1963) was the energetic commandant of the First Aid Nursing Yeomanry (FANY), which had formed in 1907 as an auxiliary to the home guard in Britain. McDougall at one point was captured by the Germans but escaped. The British army wanted nothing to do with them so they drove ambulances and ran hospitals and casualty clearing stations for the Belgian and French armies. When Canadian nurses volunteered to serve during World War I, they were made commissioned officers by the Canadian Army before being sent overseas, a move that would grant them some authority in the ranks, so that enlisted patients and orderlies would have to comply with their direction. Canada was the first country in the world to grant women this privilege. At the beginning of the War, nurses were not dispatched to the casualty clearing stations near the front lines, where they would be exposed to shell fire. They were initially assigned to hospitals a safe distance away from the front lines. As the war continued, however, nurses were assigned to casualty clearing stations. They were exposed to shelling, and caring for soldiers with "shell shock" and casualties suffering the effects of new weapons such as poisonous gas, as Katherine Wilson-Sammie recollects in Lights Out! A Canadian Nursing Sister’s Tale. World War I was also the first war in which a clearly marked hospital ship evacuating the wounded was targeted and sunk by an enemy submarine or torpedo boat, an act that had previously been considered unthinkable, but which happened repeatedly (see List of hospital ships sunk in World War I). Nurses were among the casualties. Canadian women volunteering to serve overseas as nurses overwhelmed the army with applications. A total of 3,141 Canadian "nursing sisters" served in the Canadian Army Medical Corps and 2,504 of those served overseas in England, France and the Eastern Mediterranean at Gallipoli, Alexandria and Salonika. By the end of the First World War, 46 Canadian Nursing Sisters had died In addition to these nurses serving overseas with the military, others volunteered and paid their own way over with organizations such as the Canadian Red Cross, the Victorian Order of Nurses, and St. John Ambulance. The sacrifices made by these nurses during the War in fact gave a boost to the women's suffrage movement in many of the countries that fought in the war. The Canadian Army nursing sisters were among the first women in the world to win the right to vote in a federal election; the Military Voters Act of 1917 extended the vote to women in the service such as Nursing Sisters. Australian nurses served in the war as part of the Australian General Hospital. Australia established two hospitals at Lemnos and Heliopolis Islands to support the Dardanelles campaign at Gallipoli. Nursing recruitment was sporadic, with some reserve nurses sent with the advance parties to set up the transport ship HMAS Gascoyne while others simply fronted to Barracks and were accepted, while still others were expected to pay for their passage in steerage. Australian nurses from this period became known as "grey ghosts" because of their drab uniforms with starched collar and cuffs. During the course of the war, Australian nurses were granted their own administration rather than working under medical officers. 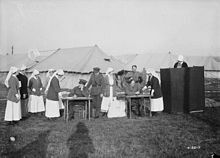 Australian Nurses hold the record for the maximum number of triage cases processed by a casualty station in a twenty-four-hour period during the battle of Passchendale. Their work routinely included administering ether during haemostatic surgery and managing and training medical assistants (orderlies). Some 560 Australian army nurses served in India during the war, where they had to overcome a debilitating climate, outbreaks of disease, insufficient numbers, overwork and hostile British Army officers. Surveys in the U.S. showed that nurses often got married a few years after graduation and quit work; other waited 5 to 10 years for marriage; careerists some never married. By the 1920s increasing numbers of married nurses continued to work. The high turnover meant that advanvcement could be rapid; the average age of a nursing supervisor in a hospital was only 26 years. Wages for private duty nurses were high in the 1920s—$1,300 a year when working full-time in patients' homes or at their private rooms in hospitals. This was more than double what a woman could earn as a teacher or in office work. Rates fell sharply when the Great Depression came in 1929, and continuous work was much harder to find. Over 4000 women served as nurses in uniform in the Canadian Armed Forces during the Second World War. They were called "Nursing Sisters" and had already been professionally trained in civilian life. However, in military service they achieved an elite status well above what they had experienced as civilians. The Nursing Sisters had much more responsibility and autonomy, and had more opportunity to use their expertise, then civilian nurses. They were often close to the front lines, and the military doctors – all men – delegated significant responsibility to the nurses because of the high level of casualties, the shortages of physicians, and extreme working conditions. In 1942, sixty five front line nurses from the General Hospital Division in British Singapore were ordered aboard the Vyner Brook and Empire Star for evacuation, rather than caring for wounded. The ships were strafed with machine gun fire by Japanese planes. Sisters Vera Torney and Margaret Anderson were awarded medals when they could find nothing else on the crowded deck and covered their patients with their own bodies. A version of this action was honoured in the film Paradise Road. The Vyner Brook was bombed and sank quickly in shallow water of the Sumatra Strait and all but twenty-one were lost at sea, presumed drowned. The remaining nurses swam ashore at Mentok, Sumatra. The twenty-one nurses and some British and Australian troops were marched into the sea and killed with machine gun fire in the Banka Island massacre. Sister Vivian Bullwinkel was the only survivor. She became Australia's premier nursing war hero when she nursed wounded British soldiers in the jungle for three weeks, despite her own flesh wound. She survived on the charity provided by Indonesian locals, but eventually hunger and the privations of hiding in mangrove swamp forced her to surrender. She remained imprisoned for the remainder of the war. At around the same time, another group of twelve nurses stationed at the Rabaul mission in New Guinea were captured along with missionaries by invading Japanese troops and interred at their camp for two years. They cared for a number of British, Australian and American wounded. Toward the end of the war, they were transferred to a concentration camp in Kyoto and imprisoned under freezing conditions and forced into hard labour. As Campbell (1984) shows, the nursing profession was transformed by World War Two. Army and Navy nursing was highly attractive and a larger proportion of nurses volunteered for service higher than any other occupation in American society. The public image of the nurses was highly favorable during the war, as the simplified by such Hollywood films as "Cry 'Havoc'" which made the selfless nurses heroes under enemy fire. Some nurses were captured by the Japanese, but in practice they were kept out of harm's way, with the great majority stationed on the home front. However, 77 were stationed in the jungles of the Pacific, where their uniform consisted of "khaki slacks, mud, shirts, mud, field shoes, mud, and fatigues." The medical services were large operations, with over 600,000 soldiers, and ten enlisted men for every nurse. Nearly all the doctors were men, with women doctors allowed only to examine the WAC. President Franklin D. Roosevelt hailed the service of nurses in the war effort in his final "Fireside Chat" of January 6, 1945. Expecting heavy casualties in the invasion of Japan, he called for a compulsory draft of nurses. The casualties never happened and there was never a draft of American nurses. ^ DeWit, Susan (2009). Fundamental Concepts And Skills for Nursing. Missouri: Saunders Elsevier. p. 964. ISBN 9781416052289. ^ Geoffrey Blainey; A Short History of Christianity; Penguin Viking; 2011. ^ Roderick E. McGrew, Encyclopedia of Medical History (1985), p. 135. ^ Catholic Encyclopedia: Hospitals. Newadvent.org (1910-06-01). Retrieved on 2013-07-28. ^ CATHOLIC ENCYCLOPEDIA: History of Medicine. Newadvent.org (1911-10-01). Retrieved on 2013-07-28. ^ James Edward McClellan and Harold Dorn, Science and Technology in World History: An Introduction (The Johns Hopkins University Press, 2006), p.99,101. ^ "Many centuries before Florence Nightingale, this Muslim woman introduced nursing to the Arabic world"
^ See Florez, "Espana Sagrada", XIII, 539; Heusinger, "Ein Beitrag", etc. in "Janus", 1846, I. ^ Geoffrey Blainey; A Short History of Christianity (Penguin Viking; 2011); pp 214-215. ^ CATHOLIC ENCYCLOPEDIA: Knights of Malta. Newadvent.org (1910-06-01). Retrieved on 2013-07-28. ^ Catholic Encyclopedia: St. Roch. Newadvent.org (1912-02-01). Retrieved on 2013-07-28. ^ Colin Jones, The Charitable Imperative. Hospitals and Nursing in Ancien Regimé and Revolutionary France (Routledge, 1989), pp 89–205. ^ Susan E. Dinan, Women and Poor Relief in Seventeenth-Century France. The Early History of the Daughters of Charity (Ashgate, 2006). ^ C. Scott Dixon; et al. (2009). Living With Religious Diversity in Early-Modern Europe. Ashgate. pp. 128–30. ^ Andrew Cunningham; Ole Peter Grell (2002). Health Care and Poor Relief in Protestant Europe 1500–1700. Routledge. pp. 130–33. ^ Virpi Mäkinen (2006). Lutheran Reformation And the Law. BRILL. pp. 227–29. ^ Keir Waddington (2003). Medical Education at St. Bartholomew's Hospital, 1123–1995. Boydell & Brewer. p. 18. ^ Merry E. Wiesner-Hanks, Women and Gender in Early Modern Europe (Cambridge U.P., 1993), pp 84, 94–95. ^ Gerberding, GH (1909). Life and Letters of W. A. Passavant, D. D. Greenville, PA: Young Lutheran Co. pp. 176, 180. ^ a b "QAIMNS World War I Queen Alexandra's Imperial Military Nursing Service QAIMNS Nurses". qaranc.co.uk. Retrieved 31 October 2011. ^ Crisp, J., & Taylor, C. Potter & Perry's fundamental of nursing (3rd ed. 2009). ^ a b c d Link text Archived 2011-12-29 at the Wayback Machine, additional text. ^ Alison Prentice, Canadian Women: A History (1988). ^ Anne Woywitka, "Pioneers In Sickness and in Health." Alberta History 2001 49(1): 16-20. ^ Sharon Richardson, "Frontier Health Care: Alberta's District and Municipal Nursing Services, 1919 to 1976." Alberta History 1998 46(1): 2-9. ^ Friedrich Katz, The Life and Times of Pancho Villa. Stanford: Stanford University Press 1998, 291. ^ Barker, Anne M. (2009). Advanced practice nursing: essential knowledge for the profession. Sudbury, Mass. : Jones and Bartlett Publishers. pp. 10–11. ISBN 978-0763748999. ^ Robinson, Jane (2004), Mary Seacole: The Charismatic Black Nurse who became a heroine of the Crimea. ^ Hill, Richard (1855), A week at Port Royal. ^ Henrietta Blackmore. The beginning of women's ministry: the revival of the deaconess in the nineteenth-century Church of England. Boydell Press. p. 131. ^ a b c Quinn, Shawna M. (2010). "Agnes Warner and the Nursing Sisters of the Great War" (PDF). Goose Lane editions and the New Brunswick Military Heritage Project. ISBN 978-0-86492-633-3. Archived from the original (PDF) on 23 November 2010. Retrieved 28 October 2011. ^ a b "Nurses (Canadian Military)". Canadian Military History Gateway. Archived from the original on 20 January 2012. Retrieved 28 October 2011. ^ Wilson-Sammie, Katherine M. (1981). Lights Out! A Canadian Nursing Sister's Tale. Mikey. p. 168. ISBN 9780919303515. ^ 3rd Australian General Hospital. The AIF Project. ^ Cynthia Toman, "Front Lines and Frontiers: War as Legitimate Work for Nurses, 1939–1945," Social History / Histoire Sociale (2007) 40#79 pp 45-74. ^ Udin, Zaf. "Nursing Uniforms of the Past and Present". Pulse Uniform. Helmstadter, Carol, and Judith Godden, eds. Nursing before Nightingale, 1815–1899 (Routledge, 2016). Bradshaw, Ann. "Compassion in nursing history." in Providing Compassionate Health Care: Challenges in Policy and Practice (2014) ch 2 pp 21+. Abel-Smith, B. The Hospitals 1800–1948: A Study in Social Administration in England and Wales (1964) London: Heinemann. Allan, P. and Jolley, M. Nursing, Midwifery and Health Visiting since 1900 (1982) London: Faber. Baly, M. (1986) Florence Nightingale and the Nursing Legacy, (1986) London: Croom Helm. Bendall, E. and Raybould, E. A History of the General Nursing Council for England and Wales 1919–1969 (1969) London: H.K. Lewis. Cowell, B. and Wainwright, D. Behind the Blue Door: The History of the Royal College of Midwives 1881–1981 (1981) London: Bailliere Tindall. Davis, C., ed. Rewriting Nursing History (1980) London: Croom Helm. Dingwall, R. and Mclntosh, J., eds. Readings in the Sociology of Nursing (1978) Edinburgh: Churchill Livingstone. Maggs, C. ed. Nursing History: The State of the Art (1986) London: Croom Helm. Santos, E.V. and Stainbrook, E. "A History of Psychiatric Nursing in the 19th Century," Journal of the History of Medicine (1949) 4#1 pp 48–74. Scull, A. Museums of Madness: The Social Organisation of Insanity in 19th Century England (1979) London: Allen Lane. Smith, F.B. The Peoples Health 1830–1910 (1979) London: Croom Helm. Smith, F.B. Florence Nightingale: Reputation and Power (1982) London: Croom Helm. Summers, A. Angels and Citizens: British Women as Military Nurses 1854–1914 (1988) London: Routledge & Kegan Paul. Sweet, Helen. "Establishing Connections, Restoring Relationships: Exploring the Historiography of Nursing in Britain," Gender and History (2007) 19#3 pp. 565–580. Webster, C. "Nursing and the Crisis of the Early National Health Service," Bulletin of the History of Nursing Group (1985) 7:4-12. White, R. ed. Political Issues in Nursing: Past, Present and Future (1985) Chichester: John Wiley and Sons. Coburn, David. "The development of Canadian nursing: Professionalization and proletarianization." International Journal of Health Services (1988) 18#3 pp: 437-456. Mantle, Jessie, Funke-Furber, Jeanette, and Vera McIvor. "The forgotten revolution: the Priory Method : a restorative care model for older persons" (Victoria, BC, Trafford, 2003). Toman, Cynthia. "Front Lines and Frontiers: War as Legitimate Work for Nurses, 1939–1945," Social History / Histoire Sociale (2007) 40#79 pp 45-74. Woywitka, Anne. "Pioneers In Sickness and in Health." Alberta History 2001 49(1): 16-20. Healey, Madelaine (2014). Indian Sisters: A History of Nursing Leadership and the State, 1907–2007. Routledge. ISBN 978-1-317-56009-8. Rafferty, Anne Marie. "Tiptoeing towards a history of nursing in Europe" Nursing history review: official journal of the American Association for the History of Nursing 22 (2013): 107-113.